Towcester – UK – September 2015: Metrix, the industrial condition monitoring systems producer, recently announced ATEX approval for its Digital Proximity System (DPS). Available with full support in the UK from Ixthus Instrumentation, the Metrix DPS is a three-part field-configurable measurement system for position, radial vibration and speed that comprises a digital proximity transducer, interfacing cable and a choice of signal conditioner - available as a driver for a machinery protection system or as a transmitter with a 4-20 mA signal to a PLC/DCS or SCADA system. ATEX approval extends the proven DPS vibration and displacement measurement product line to European customers for use in critical machinery in hazardous areas for industries such as oil & gas or mining where compressors, pumps and other rotating machines need to be closely monitored for optimal reliability. The European ATEX accreditation approval for the DPS is a first for an API 670 compliant configurable digital proximity transducer. With ATEX certification approved for EXII 1G Ex ia IIC T4 Ga (Intrinsically Safe) & II 3G Ex nA IIC T4 Gc (Non-Incendive) rated applications, the North American hazardous area rating for the DPS Proximity system covers Class I, Div 1 (Intrinsically Safe) & Class I, Div 2 (Non-Incendive). The Metrix DPS is field configurable for nearly any probe type, cable and target-material combination. Features include custom field-generated curve, as well as pre-set calibrations for a variety of manufactures, probe tip diameters, extension cable lengths, target materials, and linear ranges. Additionally the units are user-configurable to measure radial vibration, axial position, or rotational speed. The 3-wire 24V DC MX2033 is a configured proximity driver that provides a voltage output that is proportional to distance from the target, with output voltage effectively corresponding to vibration or position measurement data. 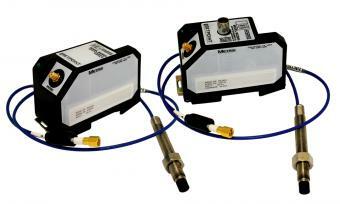 The MX2034 transmitter outputs a 4-20mA signal proportional to vibration, speed, or axial position. The 24V DC loop powered device directly connects to a PLC, DCS, SCADA system, or other instrumentation. Ixthus Instrumentation provides complete technical and sales support for the entire range from Metrix and are on hand to advise and assist customers with standard products and customised applications. Ixthus have applied and adapted these innovative products over several years in all areas of industry and research for demanding applications in military, aerospace, marine and subsea, oil and gas, mining and quarry, hoist and crane, and automotive.